Help your students appreciate how economic thinking and policy apply in the real world. This qualitative and applied introductory text has been revised and reorganized for a contemporary approach. Eighty-four case studies—three per chapter—and eighty-four videos produced by the Annenberg Foundation—one for each case study—complement the text and reflect the most current research and debates in economics. Economics USA is rich with current and historical examples that give context to economic data, performance, and debate. Three case studies in every chapter, many of them new to this edition, offer students a lens through which to see economic principles—and outcomes—at work. Cross-Chapter Cases, such as “What Should Be Done about Global Warming” after Part II or “The Debate over Post-Crisis Fiscal Austerity” after Part IV, tie the concepts of their sections together so students can see the application of wider economic principles in the real world. At the end of each chapter, “Problems and Questions” give students the opportunity to apply what they have learned and “Viewpoint for Analysis” challenges them to think more deeply about the outcomes of economic performance and policies. Three videos—one-third of which are new to this edition and each directly corresponding to an in-text case study—are available to complement each of the text’s twenty-eight chapters. New topics include Designer Jeans (Chapter 3), Big Pharmaceuticals (Chapter 10), Internet and Economic Growth (Chapter 12), Obama and Fiscal Policy (Chapter 18), and the Economic Crisis (videos in Chapters 16, 20, 21, and 25). 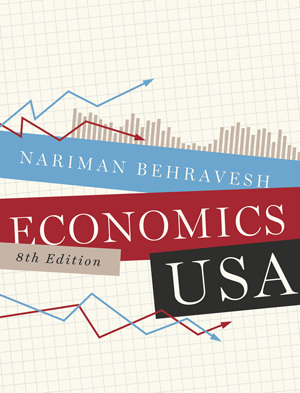 Short chapters—most are approximately twenty pages—address all the major economics topics, making Economics USA an ideal and accessible overview. Concepts are covered in concise sections with learning objectives, bolded key terms, and an end-of-chapter review, so students get everything they need and nothing they don’t. The Eighth Edition has been thoroughly revised and reorganized. Microeconomics chapters now appear before those on Macroeconomics, and the text now includes extensive coverage of the Economic Crisis. Case Study 2.2: Why Do Some Sports Stars Earn More Than the President of the United States? Case Study 8.3: Airline Deregulation: Success or Failure? How Clean Should the Environment Be? **Cross Chapter Case—Part 2: What Should Be Done about Global Warming? Case Study 10.3: Why Was Europe's Unemployment Rate Higher than America’s in the 1990s? **Case Study 11.2: Are Drug Company Profits Too High? How Much Inequality of Income? Case Study 12.2: Is Welfare Reform Working? What Functions Should the Government Perform? Case Study 19.2: What Is the NAIRU? Case Study 22.2: How Serious of a Threat Is Deflation? Has There Been a Decline in the U.S. Innovation Rate? Case Study 23.2: Asian Growth: Miraculous or Not? Case Study 23.3: How Widespread Was the Productivity Boom of the Late 1990s? How Big Are U.S. Budget Surpluses or Deficits? Case Study 24.1: Can We Afford Social Security and Medicare? Case Study 24.2: What Happened to the Federal Budget Surplus? When Is Monetary Policy Tight or Easy? Should the Fed Pay More Attention to Interest Rates or the Money Supply? Case Study 25.2: How Much Attention Should the Fed Pay to the Stock Market (and House Prices)? Should the Fed Be Governed by a Rule? Case Study 27.3: NAFTA: "Jobs, Jobs, Jobs" or a "Giant Sucking Sound"? Case Study 28.2: Are Currency Speculators to Blame for the Volatility in International Financial Markets? How Well Have Floating Exchange Rates Worked? Should the Value of the Dollar Be Stabilized? **Cross Chapter Case—Part 6: Should We Be Worried about the Rise of China, India, and Other Emerging Markets?